Steve was raised in Wilmington, Delaware. After a tour of duty in the US Army as a Green Beret Medic, he moved to Salt Lake City, Utah, where he graduated with a BS in Biology from the University of Utah. He received his Doctorate in Veterinary Medicine from Colorado State University. While attending veterinary medical school, Steve met his wife to be Renee Leton. After graduation the two of them moved to southern California where they interned at West Los Angeles Veterinary Medical Group. Afterwards they worked for six years at an emergency hospital. In 1992, Steve and Renee purchased El Camino Veterinary Hospital and moved to Atascadero. Here they have raised their three children. In addition to working in private practice, Steve has been the veterinarian for the Charles Paddock Zoo for the past eighteen years. Dr. Robinson enjoys swimming, cycling, running and supporting his family in their various athletic pursuits. Renee Leton was born in Santa Monica, California and raised in Honolulu, Hawaii. She graduated from the University of Hawaii with a B.A. in English and began her veterinary school education at Colorado State University. In 1985, she married fellow student, Steve Robinson, and they graduated together in 1986. She completed an internship at West Los Angeles Veterinary Medical Group after working in emergency medicine for a year at Eagle Rock Emergency Pet Clinic. She delivered three children, a daughter and two sons, in quick succession between 1988 and 1992, and moved with family to Atascadero, where they had purchased El Camino Veterinary Hospital. Her professional interests include emergency medicine, internal medicine, and cardiology. In her free time she coaches high school soccer and finds time for the gym, traveling, and long-distance hiking. 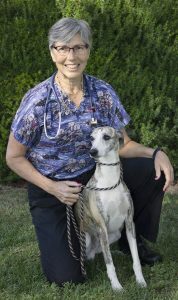 Stephanie Tarica joined El Camino Veterinary Hospital in 1992 while attending Cal Poly as a pre-vet student. In 1993, she graduated with a bachelor of science in biology. 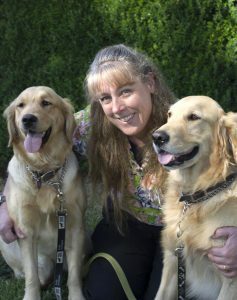 In 1997, she received her veterinary degree from the University of California at Davis and returned to work at ECVH. Stephanie left ECVH in 2000 to work closer to home, at Bear Valley Animal Clinic in Los Osos. In 2005, she moved to Atascadero and ecstatically rejoined the ECVH family. Her special interests include internal medicine, endocrinology and dermatology. Stephanie enjoys spending time with her family. Her daughter attends Cal Poly, San Luis Obispo, double majoring in biology and music. Her son goes to Atascadero High School. She loves watching his tennis matches and musical performances. Stephanie looks forward to getting to watch her daughter perform in the choir at Cal Poly. She can be found every morning from 5 a.m. to 8 a.m. walking her three dogs and/or riding her horses. Sometimes she even gets to spend a little time with her husband, Joe. Dr. Ramos is a native of Southern California and grew up in an agricultural community on the border of California and Arizona. His interest in veterinary medicine started at an early age by growing up with farm animals, dogs, cats and many pocket pets. He attended Cal Poly Pomona as an undergraduate and was accepted to the UC Davis School of Veterinary Medicine, graduating in 2015. After graduation he moved to the central coast where he had family and friends already residing. Dr. Ramos spent many summers in Paso Robles and moving to the area had always been a dream. 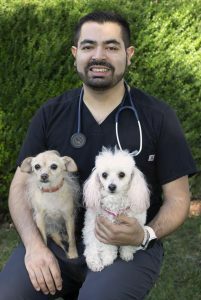 He was fortunate enough to meet his wonderful veterinary family at El Camino Veterinary Hospital and enjoys the variety of pets and people the practice has to offer. Devoting time and attention to challenging cases is a passion of his. He regularly attends veterinary conferences and stays current on new therapies and diagnostics available in the veterinary field. He is a member of the American Veterinary Medical Association and the California Veterinary Medical Association. He also treats many patients from local animal rescues and humane societies. All of his pet family members have been adopted and rescued through his work in veterinary medicine. On a personal level he enjoys wine, concerts, travel and the outdoors.